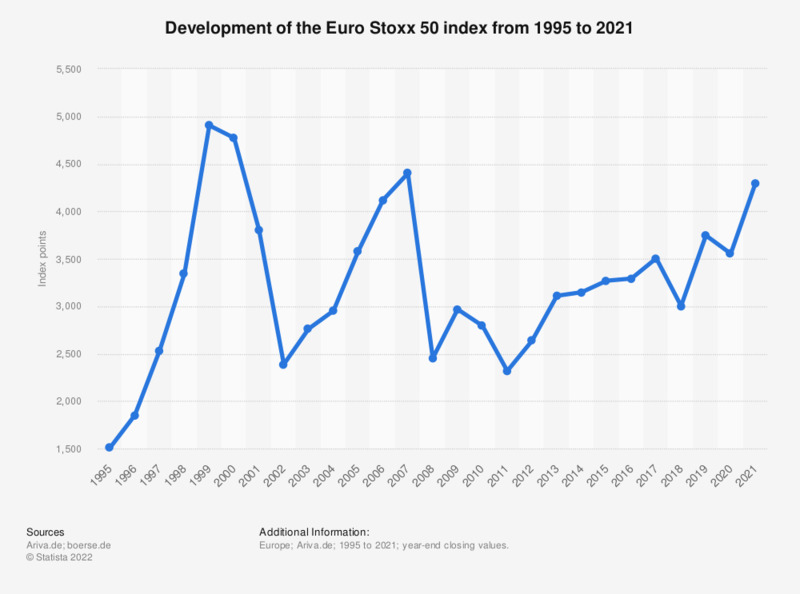 The statistic shows the annual development of the Euro Stoxx 50 index from 1995 to 2018. Euro Stoxx 50 is the index designed by STOXX, globally operating index provider headquartered in Zurich, Switzerland; which in turn is owned by Deutsche Börse Group. This index provides the broad representation of the Eurozone blue chips performance. Blue chips are the corporations known on the European market for quality, reliability and the ability to operate profitably both in the good and in the bad economic times. As of December 2016, some of the following reputable companies formed the Euro Stoxx 50 index: Adidas, Airbus Group, Allianz, BMW, BNP Paribas, E.ON., L'Oréal, ING Group NV, Nokia, Phillips, Siemens, Société Générale SA or Volkswagen Group. The year-end value of the Euro Stoxx 50 peaked in 1999, with 4,904.46 index points. It noted significant decrease between 1999 and 2002, then an increase to the level of 4,399.72 in 2007, prior to the global recession. Since the very sharp decline in 2008, it noted a tentative increase, never yet reaching the pre-recession levels. As of end of 2018, Euro Stoxx 50 index amounted to 3001.42 points.